While doing interviews for our new bicycle tourism podcast, a few interesting themes have emerged. Many of them we have come to understand through intuition, but now have confirmation from some primary sources. Small towns (we are defining “small” as towns with a population of less than 5,000) will generally notice the benefits of bicycle tourism most. Not that bicycle tourism can’t benefit larger destinations and metro areas, but the size of the bike event or amount of bicycle traffic has to be exponentially larger to move the needle. There is just a larger signal to noise ratio once populations get larger. Coincidentally, small towns and destinations are what cyclists seek out because of the general lack of traffic and unique character. Because small towns can benefit the most, it is also where we have seen the most innovation in terms of bicycle hospitality. The Bike Camp in Twin Bridges, MT is a great example, as is the Spoke’n Hostel in Mitchell, OR. We recently heard of a KOA franchise in Butte, MT that is creating bike specific accommodations as well as opening an account with QBP to provide bike tools and bags. With very little resources, small towns are creating unique experiences for traveling cyclists. Because of the innovation and unexpected nature of small town bike hospitality, cyclists spread the word virally. We have seen this in the case of Spoken Hostel, where cyclists will come in having heard of the place several states and weeks away. I think two things are at play: cyclists as a tribe spread information quickly throughout the community (forums, road encounters, Instagram); and the nature of being surprised at cycling hospitality makes that experiences that much more powerful. There is a great episode of the Hidden Brain podcast (episode: Decided Already! ), that talks about how uncertainty creates a sense of heightened experience. I think that is why something like Bike Camp can appear as nothing more than a gazebo to the residents of Twin Bridges, MT, but has become a bicycling destination for traveling cyclists. Probably the harshest truth is that small towns have bandwidth and budget barriers. People have to wear multiple hats in small towns and many are stretched thin. And in cases where there might be a strong champion of cycling, that person may lose interest or move away. Since many people in small towns may not ride a bike there is also a knowledge gap of the market and what other destinations have executed. Budget issues are true everywhere, but are particularly more acute in small towns. There just isn’t a whole lot of money to go around and to peg a town’s hope on a strange niche is a big risk for most places. After seeing these issues for the last five years since we’ve focused on bicycle tourism, we are trying to do something about it. We’ve just launched an online workshop where we can share our knowledge with small towns interested in bicycle tourism. Our goal is to work collaboratively with small town CVBs and regional DMOs to give them a jumpstart in the process. Even then, we know it may not be accessible to everyone, but we are hoping that for those destinations that work with us we can set them up for future success. Your interview of the hosts at Spoke’n Hostel that there are benefits other than just economic. There is also a psychological or morale boost. 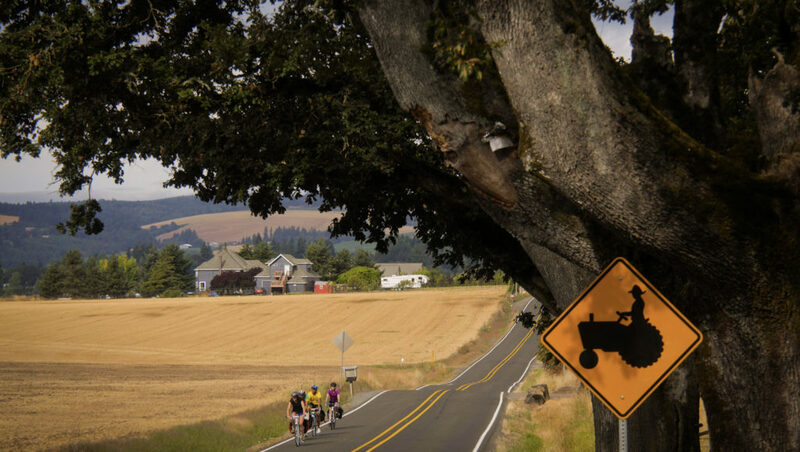 The same is true of the Ride Oregon routes. Yes, fond memories of the Veronia rail trail after riding up the Oregon coast and across the range to Portland in 2015.